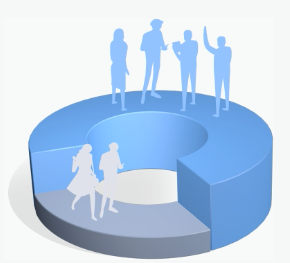 Including data in your presentations is a great way to bolster your points. Displaying data can enhance your words even further, but sometimes the usual graphs aren't the best option for visualizing relationships between concepts. If so, perhaps trying a Venn diagram is the way to go. A Venn diagram can be used in any field of study to visually represent relationships between concepts. Each set of elements is represented as a circle or other shape and the overlapping regions are used to depict what two or more concepts have in common. They can be extremely complex, or extremely simple, depending on the need. 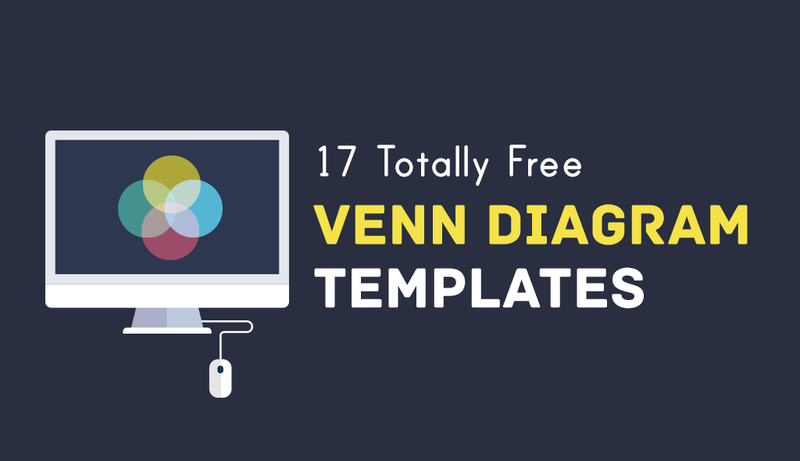 We’ve gathered here 17 useful Venn diagram templates to help get you started. 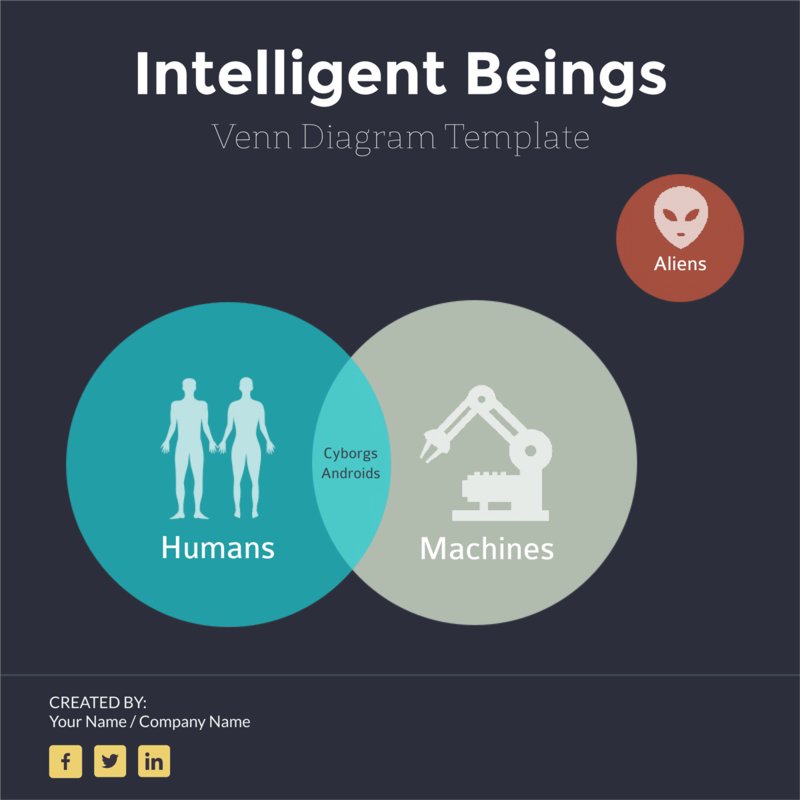 Probably the most common type of Venn diagram, as well as the simplest, this template is best used to compare two subjects. You’ve probably seen it in countless presentations and classrooms. Done right, however, it’s an effective tool. 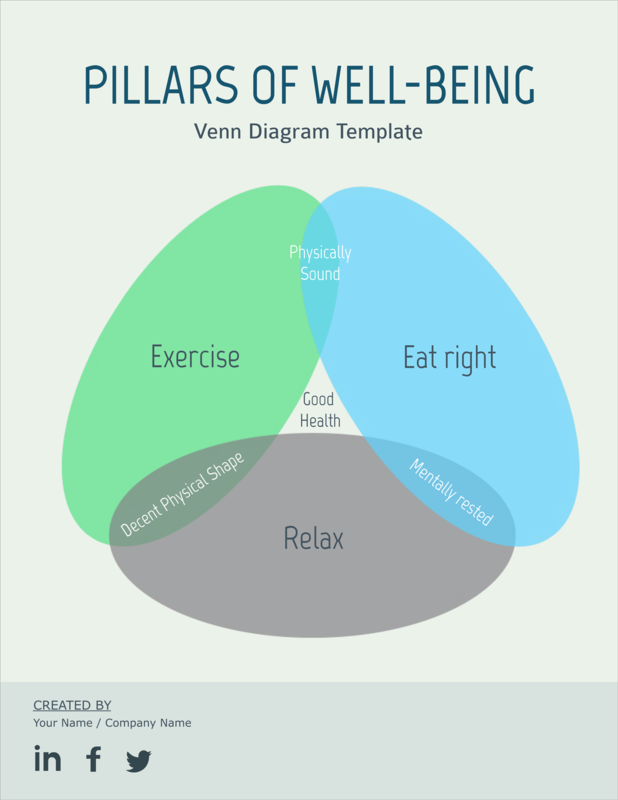 This Venn diagram is relatively easy to use—choose your two focuses and put them in their respective circles on either side, give a list of their traits, and then place their common traits in the middle. To keep your visual from feeling lazy, make sure you think about typography and what would best support your words. Try adding a background or playing with different visual styles. 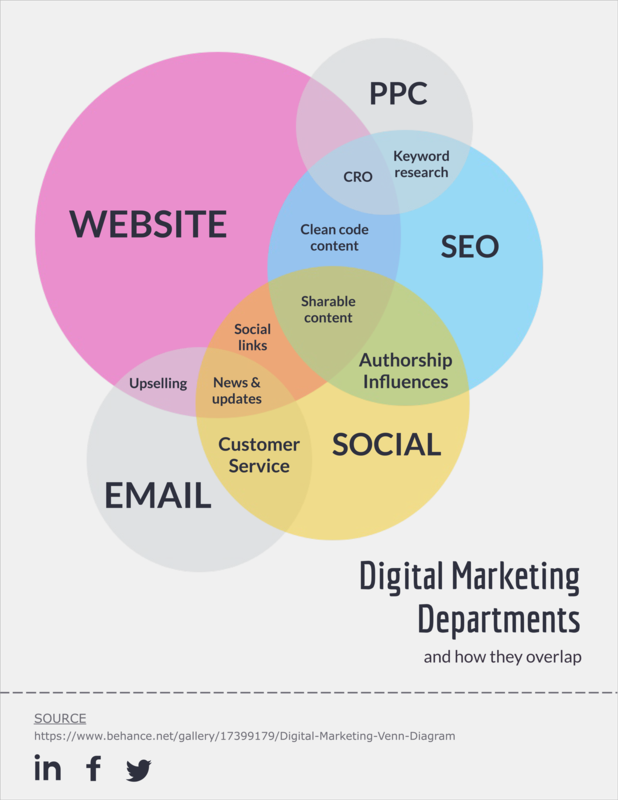 A good example is the Venn diagram at the top of this page. It’s simple, but professional looking. The colors and text work well together, with white lines that help define the middle section. Sometimes, simple is better. For a slightly more creative two-circle Venn diagram with a more environmental feel, try using the “raindrop” template. Essentially, instead of using two circles, you would use two raindrop-like shapes connected at their larger ends. Since this is largely a style change, you can use any information you’d also use for a two-circle diagram. 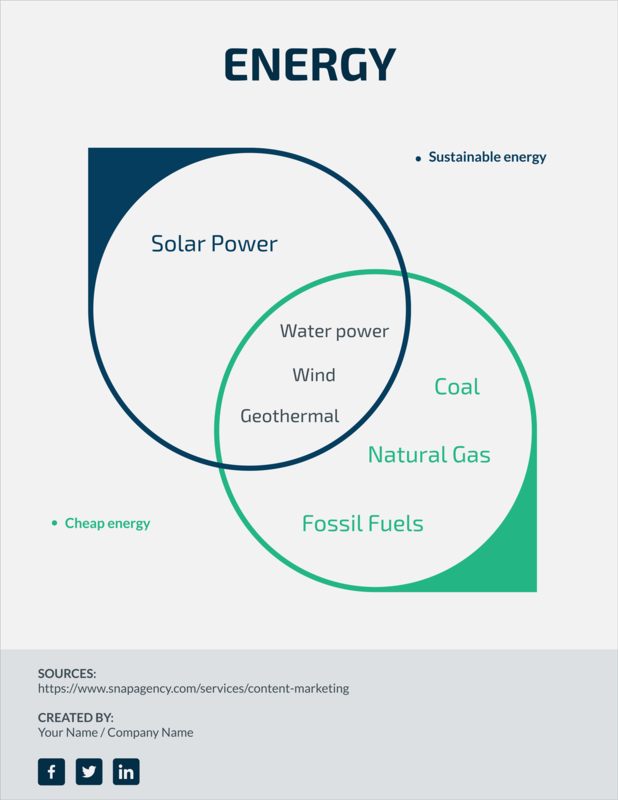 However, because of the environmental theme, this sort might be better used to represent such elements as how sustainability and energy consumption relate, or other similar topics. Experiment with different shapes that relate to your subject and see which works best. Slightly more advanced than the two-circle, but just as common, this Venn diagram lets you visualize the relationship between three subjects rather than just two. This Venn diagram is a relatively good example. 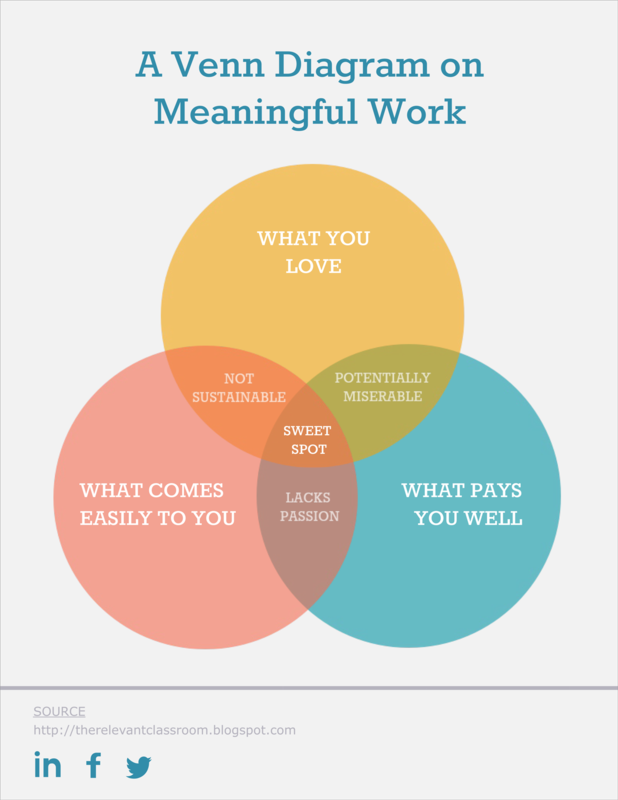 It uses overlapping circles to remind readers that meaningful work not only pays well, but makes you passionate and comes naturally to you. When editing this template, make sure you remember to not only visualize how the three different subjects interact with their counterparts individually, but how they all come together as well -- something to keep in mind for all of the more advanced templates. 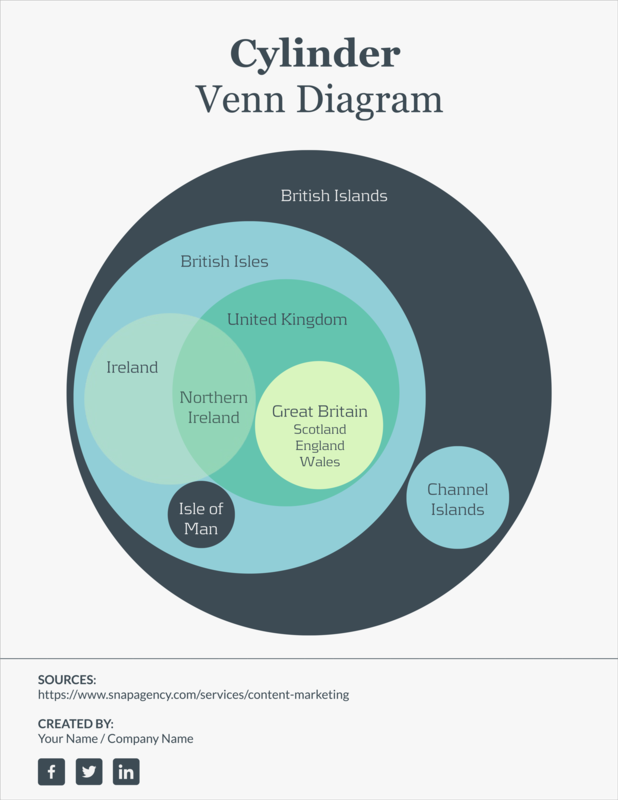 If you want an interesting take on a three-subject Venn diagram, then the triangle template provides a great example. Much like the three-circle, this template includes three shapes that interlock — only this time, they create a triangle instead of an amorphous shape. The three “sides” of the triangle contain the individual subjects, with each corner representing how those subjects interact. The triangle’s center can feature how they all interact together, or can simply be empty. The sides can be created out of ovals, rectangles, or any option you’d prefer. 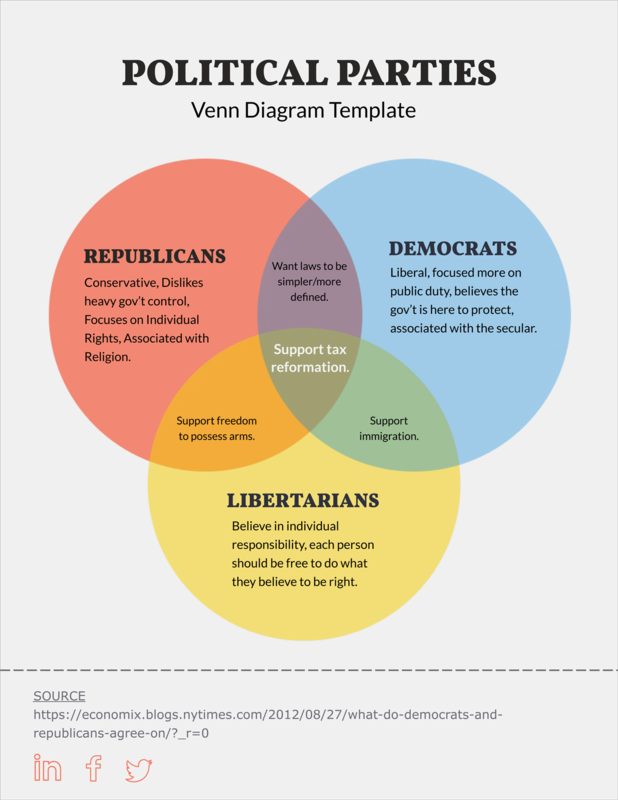 This diagram on political parties process is a good example of a three-set Venn diagram, with text inside the circles to help further explain each topic, and the center being the “sweet spot” where everything meets. The three circles with transparency emphasize how each subject connects and help make the areas where the circles overlap more distinct. A bit more complex, this example can use four circles or ovals to compare its four different parts. 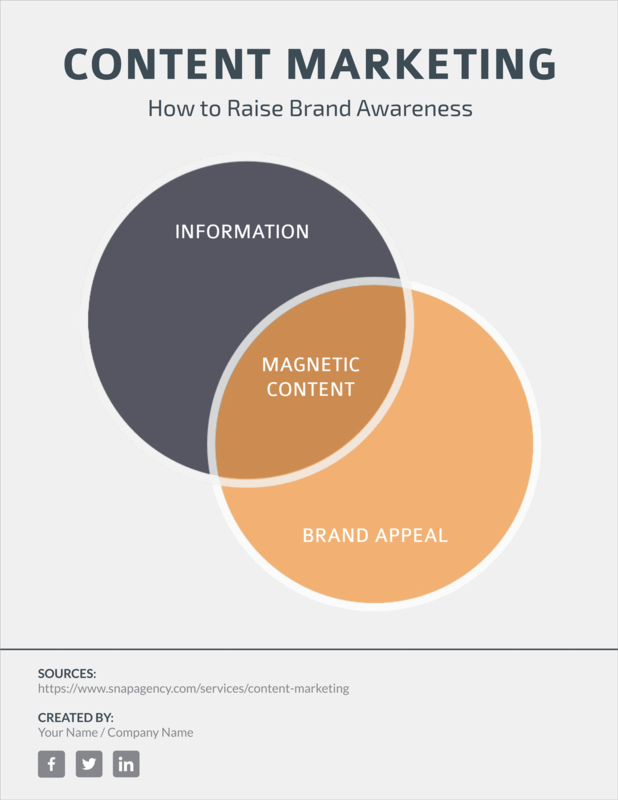 Take this example on the marketing landscape. 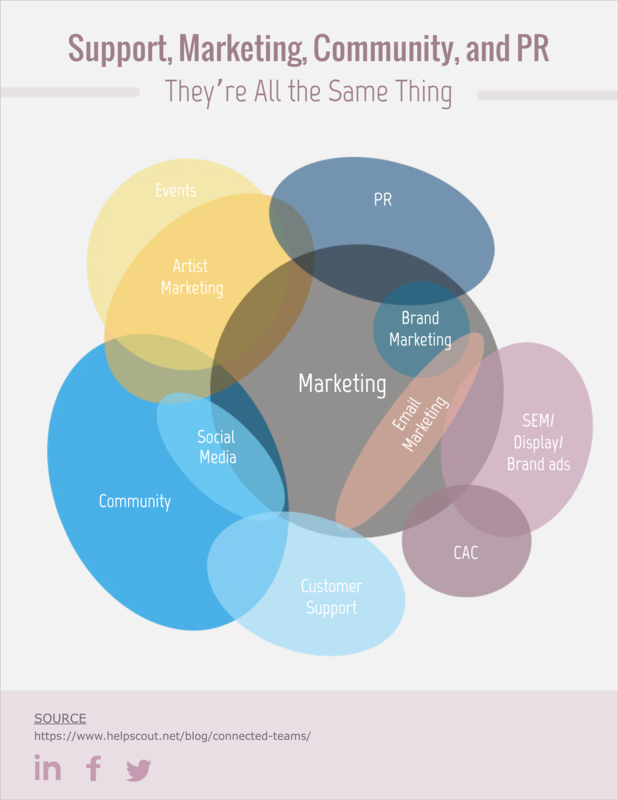 Each circle represents a different aspect of marketing, with the interconnecting parts representing what format uses each aspect. A variation of the four-subject template, this particular example can be used to give some added flair to your visuals. The diamond/rectangle template involves overlapping—you guessed it—diamonds or rectangles instead of circles, allowing for a different look and an easy trail for the eye to follow. These templates can also be relatively complex. 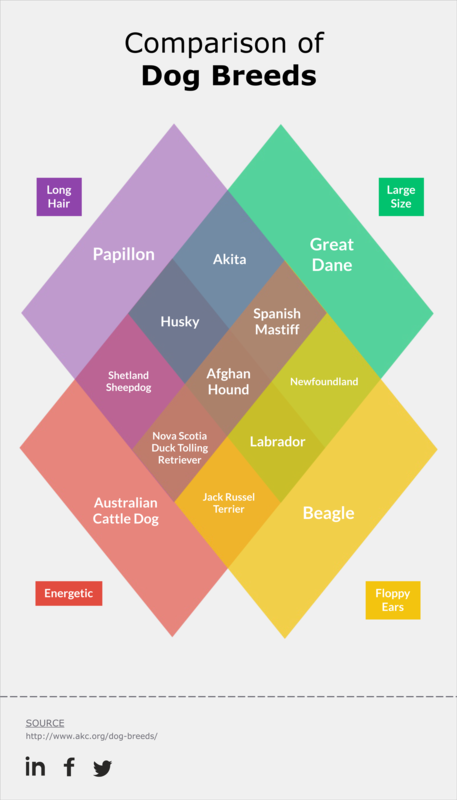 Take, for example, this diamond Venn diagram on dog breeds. The diagram lists a different trait for each rectangle, and then inside lists dog breeds with those traits, or combinations thereof. The multiple connections through these diamonds allows for a variety of different examples to be shown, and the blended colors and straight lines help move the eye. Want something really complex, but also interesting to look at? Try creating a star. The “star” in question is created from five different ovals, all positioned so they overlap in different ways. This allows you to see how five subjects interact with each other, creating a variety of unique options. Since this template is rather complex, try to make it as easy to follow as possible. For example, color code each oval, with the blended colors representing the common areas between two separate subjects, or create a labeling system that makes the interactions easier to track. 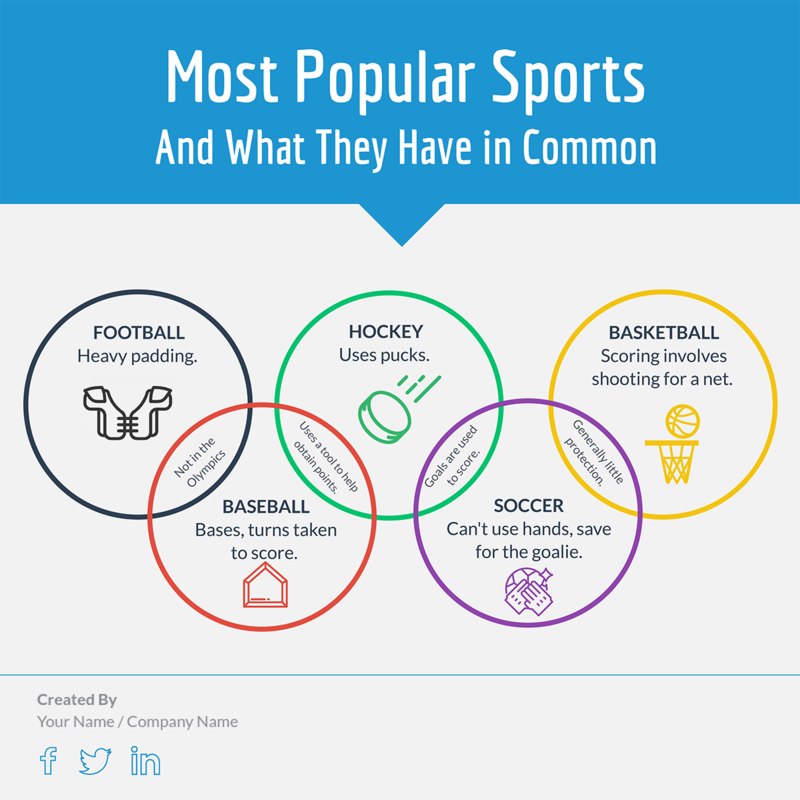 This five-subject Venn diagram is great for any sports fan, using rings to create an image styled like the Olympics’ symbol. Each ring, of course, represents a different subject, and where they cross each other shows how the subjects interact. While much easier to follow than the “star” example, it also allows for less interaction, so make sure you have each subject where it’ll be most effective. This can be best used to show how certain concepts interact with others. For example, you can show how two elements in a story’s plot relate to each other, and how another, separate element relates to just one, and so on. 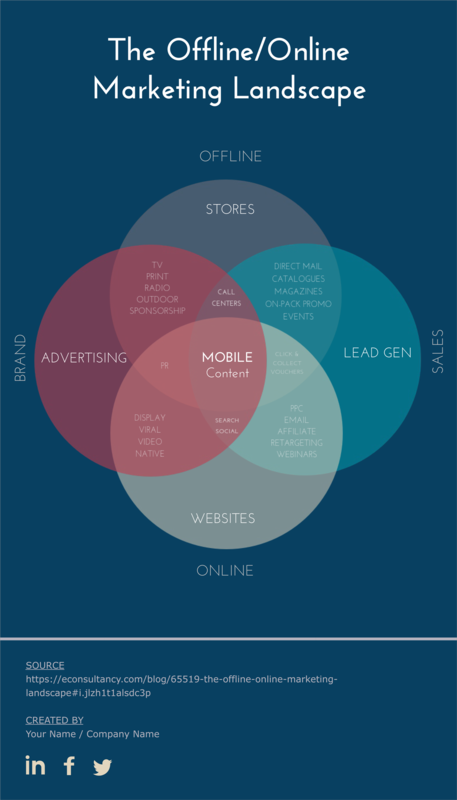 If you want a bit of a different approach to a Venn diagram, the multi-layered template might be the way to go. In this template, you start with a large outer circle, and then nest smaller circles inside. The outer circle usually contains a single subject, and the nested circles, rather than containing subjects on their own, show how each new addition changes the original. Check out this cylinder Venn diagram. It looks at the relationships of various British Islands with each other. Each circle represents a different area; some are contained within others, and others appear as separate entities. If you want something that stands out, this type of Venn diagram could work really well. It uses a similar approach to the multi-layered template in execution, only it takes the form of a 3D, nested image. This template makes it really easy to get creative. 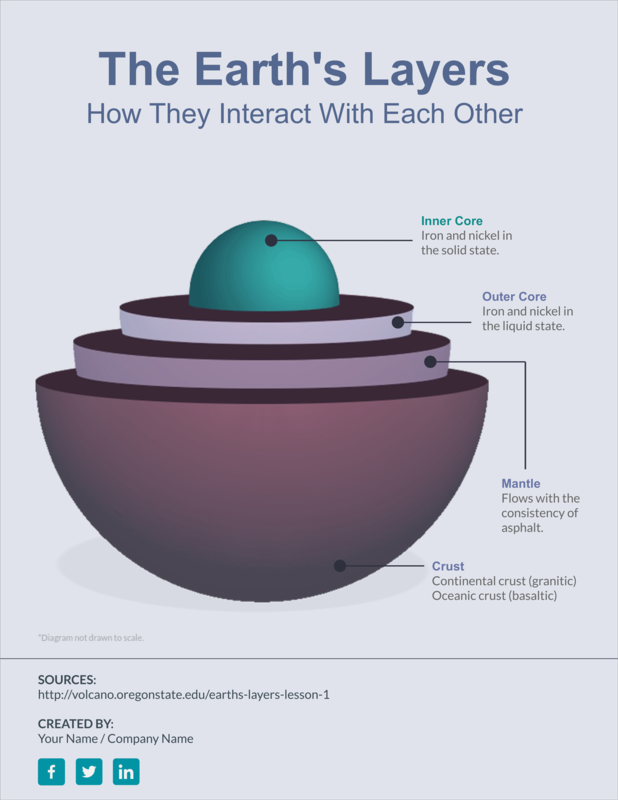 For example, you could use actual nesting dolls to play on the “subject within a subject” aspect, or use a diagram of the Earth’s layers to show how each one interacts with one another. This template’s main interest is in how a variety of subjects interacts with a single one, but it does so in a very interesting way: the circles connected to the subject rise along the edge of the largest, growing bigger as they do so. This can be a great way to show the importance of each subject’s interaction with the main one, with the smallest being the least important, and the largest being the most. It can also be used to show the complexity or amount of the different subjects that interact with the focus. Similar to the “arcing” template, this one uses different-sized circles to get a point across; unlike the former, this template shows how they all interact. 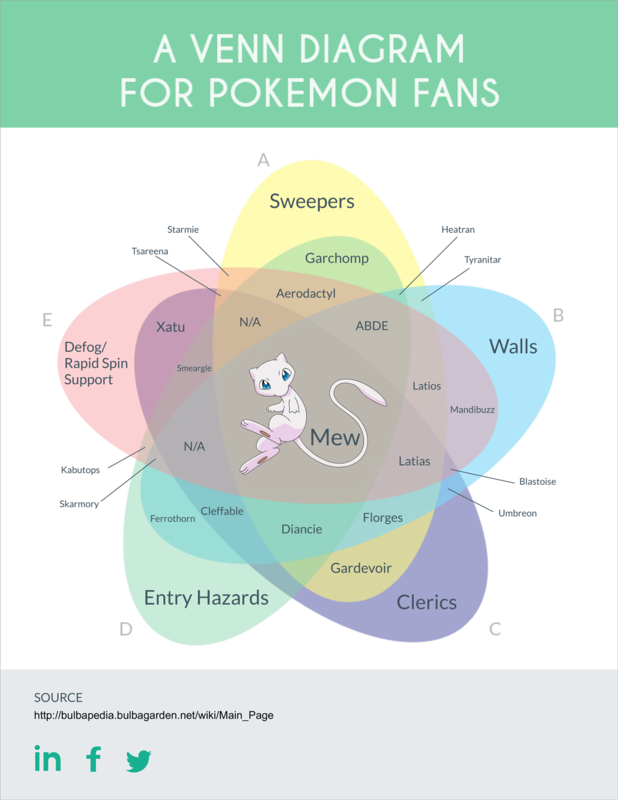 Much like the arcing Venn diagram, this can show the importance or relative size of the different subjects. 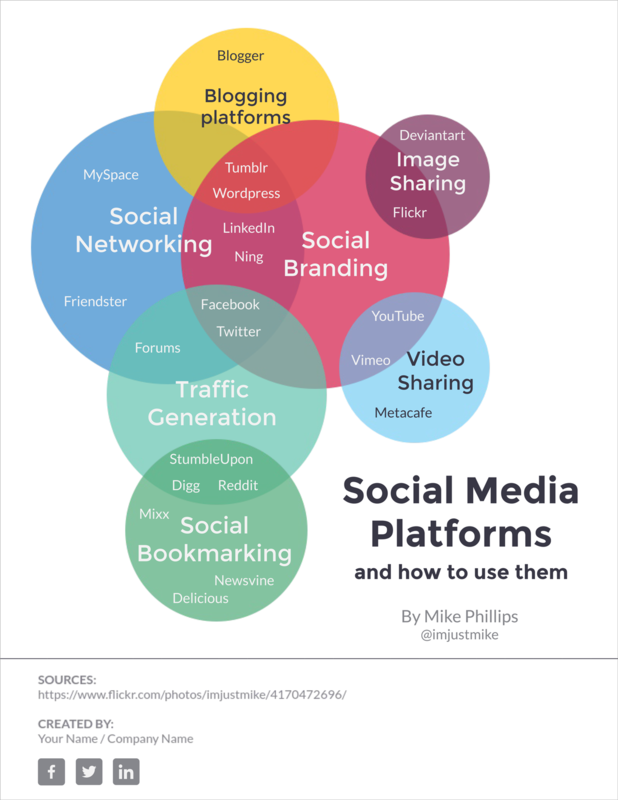 This is a particularly good example, focused on social media platforms. The center circle (social branding) interacts with several others outside it, all of which list social media sites that work best for the given combinations. A picture can speak a thousand words, so what better way to show how subjects interact than by using them? This template often uses few words, instead letting the images do the speaking. For example, this one humorously displays the combination of a hippo and crates. 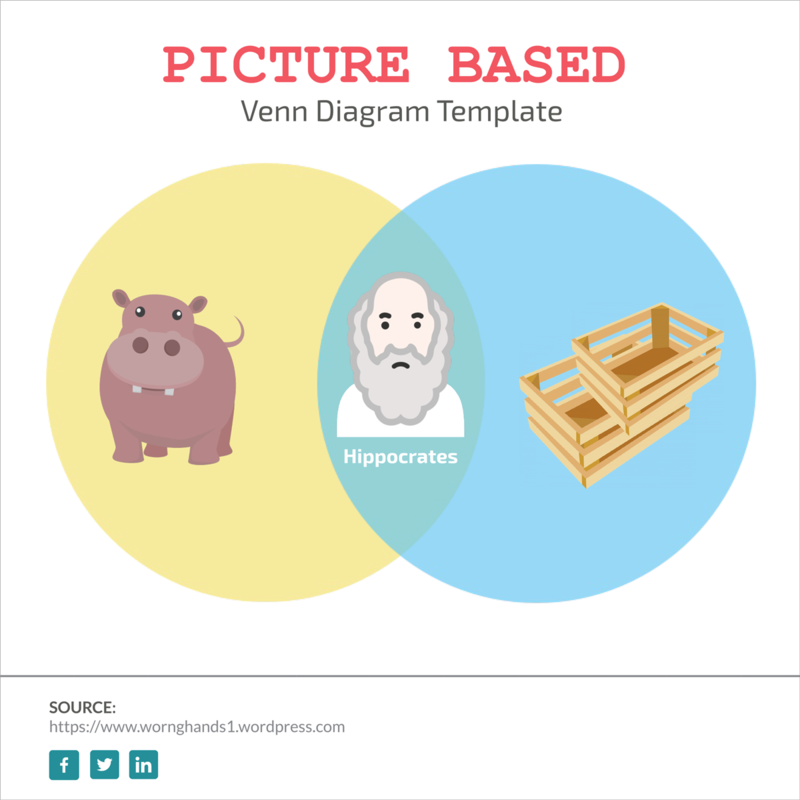 You can use other creative examples to explain subjects, such as including pictures of two different subjects in the outer circles, and then having the connection point be a different picture entirely, representing what the two create when combined. Only one style not working for you? Try mixing several different styles to get the effect you want. For example, you could combine a two circle and a multi-layered, showing how the multiple effects of one grouping seep over into another subject. 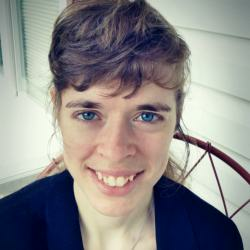 A great example is by Elizabeth Tobey, who combines nested and alternate sizes into a complex, multi-faceted visual. These tend to be very complex, so make sure your viewers can follow the information being presented. Euler diagrams are similar to Venn diagrams, in that they illustrate two or more subjects, but different in one key feature: there is at least one subject that doesn’t overlap with another. These can be very useful to show just how different two subjects are. Euler diagrams can be used alone (such as having two circles close together, but not overlapping) or combined with Venn diagrams (such as having two circles overlapping, and one placed further away, as in the previous example). 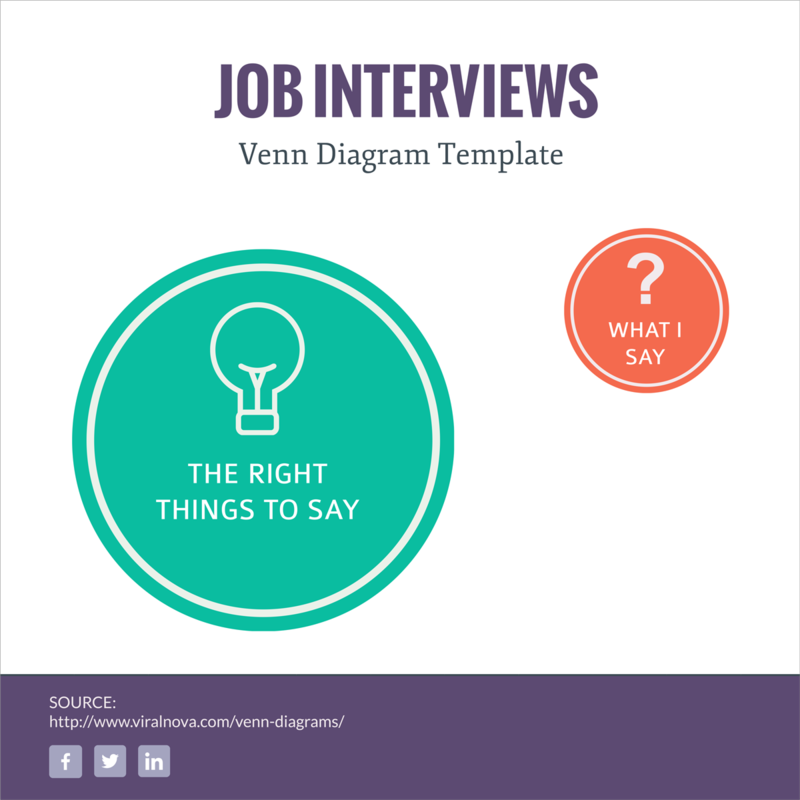 Test them out and see if using one such diagram might work well for your project. These are just a few ways you can modify a Venn diagram template to display relationships between concepts. What are some templates you’re a fan of, or what variations do you have on the above? Share them with us in the comments section below!